"Sometimes you miss with the first bullets and the tracers give you away"
Colonel Francis Gabreski had his first war time assignment with the 15th Fighter Group in Hawaii and was at Wheeler Field when the attack on Pearl Harbor took place. 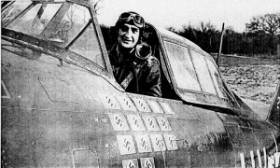 In November 1942, he went to England and flew 20 combat missions in a Spitfire before transferring to the 56th Fighter Group in England flying P-47 Thunderbolts. In July 1944, Colonel Gabreski was on furlough awaiting transportation directions to the United States when he volunteered to lead his squadron into Germany. Returning, he elected to hit a German air field that had many planes parked on it. In a low level attack on the airfield, his propeller tips hit the ground causing him to crash land. He fled from his aircraft and eluded the Germans for five days. He was captured on July 20, 1944 and spent the rest of the war in Stalag Luft I prisoner of war camp and was liberated by the Russian Army in April 1945. He ended the war with 28 enemy fighters destroyed in air combat - the joint highest score for a USAAF pilot in Europe. During his tour in the European Theater of Operations, he flew 166 combat missions. In June 1951, Gabreski was back in combat during the Korean War, flying F-86 Sabres, where he once more excelled becoming the eighth 'Jet Ace' on April 1, 1952. He ended up with 6� Mig 15s to his credit. In August 1949, Colonel Gabreski was reassigned to the 56th Fighter Group at Selfridge Air Force Base, Michigan, as Commanding Officer. In June, 1951, he was assigned to the 4th Fighter Interceptor Wing in Korea and later as Commander of the 51st Fighter Interceptor Wing. While with the 51st, Colonel Gabreski became history's eighth "Jet Ace" on 1 April 1952. Colonel Gabreski returned to the United States June 16, 1952, and was assigned to the Office of Inspector General, USAF, at Norton Air Force Base, California, where he was Chief of Combat Operations Section. In 1954, Colonel Gabreski was chosen to attend the USAF Air War College at Maxwell Air Force Base, Alabama, graduating in 1955. He was then assigned to Headquarters, 9th Air Force, Shaw Air Force Base, South Carolina, as Deputy Chief of Staff, Operations. In the summer of 1956, he was assigned to Myrtle Beach Air Force Base, South Carolina, as Commander of the 354th Tactical Fighter Wing. After 4 years at Myrtle Beach, Colonel Gabreski was assigned to command the 18th Tactical Fighter Wing, F-100 unit at Kadena Air Base, Okinawa. In 1962, he was selected by General Emmet "Rosy" O'Donnell to be his Executive Officer at Hickam Air Force Base, Hawaii. In the summer of 1963, the Colonel assumed the post of Inspector General for the Pacific Air Forces. His last assignment before retiring from the military was Commander of the 52nd Fighter Wing at Suffolk County Air Force Base, New York, from August 1964 to November 1967. Colonel Gabreski has accumulated over 5000 hours flying time, with 4000 hours of this being jet time and has a combined score of 37.5 enemy aircraft destroyed (34.5 aerial victories) during World War II and the Korean Conflict.